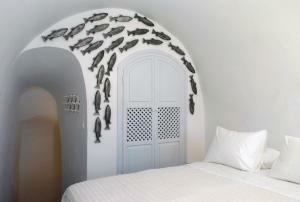 This intimate 4 star hotel is located at the entrance to the town of Oia. It offers personalized services and a wide range of accommodation in an environment of unique natural beauty. This superior studio consists of 1 master bedroom with large 1 bed, fully equipped kitchenette, coffee table, bookcase and bathroom with shower. It also includes a spa bath. The Sailor's House accommodation is located at pool level and consists of 1 bedroom with 1 large bed in the loft located on the top floor, which opens onto the living area. 1 additional guest can be accommodated on the sofa bed. There is also a small balcony overlooking the town of Oia and the caldera, located at the front of the house, where breakfast is served and room service is available. The Gardener's House accommodation is located at pool level and consists of 1 small and cozy bedroom, large 1 bed, dressing table, built-in wardrobe and bathroom with shower. It also includes a balcony with sea views, where breakfast is served and room service is available. This duplex is elegantly decorated and is located at pool level. It also consists of 1 bedroom with 1 large bed in the loft located on the top floor, which faces the living area. In addition, there is a sofa bed that can be converted into a double bed 1 and a terrace where breakfast is served. Cook's House is the largest duplex in the property and consists of 1 bedroom with 1 large bed and bathroom located on the mezzanine facing the living area. It also includes an additional bathroom on the ground floor and a private balcony with panoramic views of the caldera. The Artisan's House is the largest superior studio in the property and has 1 master bedroom with 1 large bed located in the recess of the boiler. In addition, it consists of 2 traditional sofas that can be converted into single beds to accommodate additional guests. It also includes a spacious bathroom with a vaulted ceiling and a walk-in shower. There is also a terrace that overlooks the town of Oia and the caldera, located in front of the house, where breakfast is served and room service is offered. Captain's House has a private hot tub located on the corner of the secluded terrace and offers views of the caldera and the village of Oia. It also consists of living room equipped with 2 sofa beds that can be converted into 2 single beds, as well as dining table.